Daniel Hughes scored the equaliser for Warrenpoint Town in a Premiership match which was held up when the floodlights failed to work. The teams had been taken off by referee Evan Boyce after 71 minutes because it was getting too dark but the match resumed when the fault was repaired. 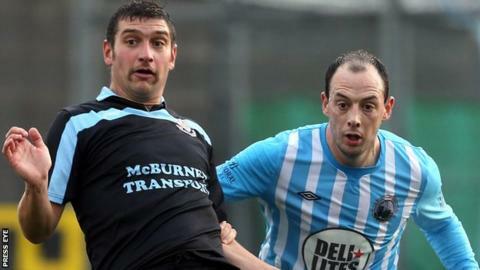 Ballymena had been leading 2-1 at that point thanks to two goals by former Linfield striker Matt Tipton. Daniel Hughes had given bottom club Warrenpoint the lead on 34 minutes. Warrenpoint will be pleased to have rescued the point but they are now three points adrift as one-from-bottom Dungannon won away to Coleraine. The result means Ballymena have now gone eight league matches with a victory. "I think if the lights had not gone out we would have gone on to win the match because we had the momentum and were going forward," said Ballymena manager Glenn Ferguson. "They had a chance to regroup and we paid the price. "But really this kind of thing should not be happening in the top league in the country. "It is embarrassing for it to happen at this level."